Home » Apple » How to Stream Music with iCloud? How to Stream Music with iCloud? Apple has released an iCloud months ago, system that will allow you to be able to share and stream your music in order to be able to take the weight of the storage on your mobile devices. The idea behind the iCloud system is that you will be able to match songs that you already own with the iTunes music library; when you do this, iTunes will automatically stream that version of the song from the iTunes library meaning that you will not have to have it stored on your ipod touch or iphone. The great thing about the iCloud is that it will cost you just $25 per year at the moment and this will allow you to be able to access your entire music collection from any web enabled device. IT also means that you will have access to songs that you haven’t purchase don iTunes using the service including songs that you have purchased from Amazon and any other means. It’s possible to stream the music to any web enabled device that is registered with your iTunes music account. Obviously, the best devices for doing this with are the iPhone and the iPod Touch and this is clearly what Apple is aiming to happen. Apple has seemed reluctant to offer a 64GB iPhone in the past but it seems that with the iCloud solution, you will have even more storage space than 64GB. 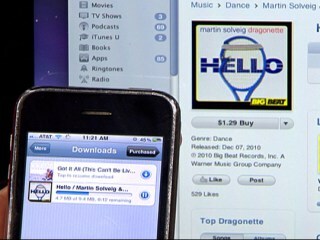 Watch the video below to know how to stream music with iCloud on your iPod touch or iPhone.